The Legend of Zelda: Skyward Sword will be releasing on November 20, just 15 days from now. The game will be getting a lot of attention in the next few weeks, so we will be taking a look at the Zelda games that came before The Legend of Zelda: Skyward Sword, and how many hours Wii owners have reported enjoying those. First up, The Legend of Zelda! The Legend of Zelda was the first game in the Zelda series. It was originally released for the Nintendo Entertainment System (NES) on August 22, 1987. The Legend of Zelda was re-released on November 19, 2006, through the Wii's Virtual Console service, and Wii owners can find The Legend of Zelda still available for download through the Wii's Shop Channel. The game is priced at 500 Wii Points, which is just $5. 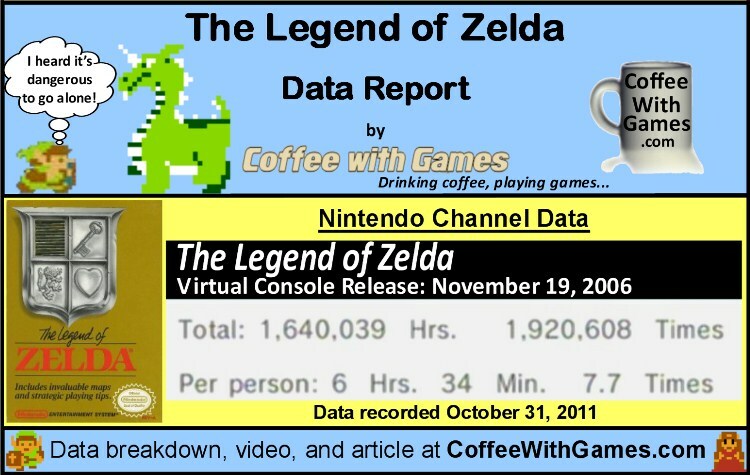 How many hours have Wii owners reported playing The Legend of Zelda with nearly 5 years of game-play possibly reported? Let's take a look! Can you name the boss in the image above? 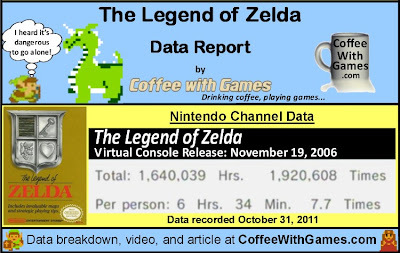 The Legend of Zelda now has 249,429 Wii owners that have reported game-play data through the Nintendo Channel, with 1,807 days possibly reported. The game's average play-time per day/session reported is just over 51 Minutes. Since February of this year, The Legend of Zelda has made Nintendo about $93,300 in the United States. Overall, the United States' Virtual Console release of The Legend of Zelda has made Nintendo about $1,247,145, based on just the number of players that have reported data and the game's $5 price point. I mentioned in February that I could not remember playing and beating The Legend of Zelda. I have not played the game since the last report, as I do not own it, though I was tempted to buy it the other night; but my backlog keeps staring me in the face! Seeing The Legend of Zelda has more than 6 hours of game-play reported "Per person", and that average has increased by 16 minutes since the last report, I think shows Wii owners are really enjoying the game. Knowing there are retail games with higher price points but lower hours "Per person" reported on the the Nintendo Channel, I think shows the game is worth the asking price of $5. As of now, I will not be purchasing The Legend of Zelda: Skyward Sword when it releases in a 2 weeks, because of the New Year's video game resolution I made. If I make it to January, I am actually debating on downloading The Legend of Zelda on the Virtual Console and completing it first, before looking at purchasing Skyward Sword. My only hesitance with downloading a Virtual Console title now, is that I want to know for a fact that Nintendo is going to allow our Wii Virtual Console and WiiWare games to be transferred to the Wii U, and that I will not have to purchase them all over again. Have any of you played through The Legend of Zelda recently, or are you planning on it in the next 2 weeks before The Legend of Zelda: Skyward Sword is released? Nah I beat it when I was like 11, that was about 20 years ago lol. I doubt I'll get the new Zelda when it comes out. Dang you Nintendo, making money for you is so easy lol. I don't know if it's more nostalgia than gameplay, but I do enjoy the original zelda on Wii VC from time to time. Hadn't played it in several months and won't be playing it or Skyward Sword for awhile until the Wii is unpacked. That's a good point on the Wii U and being able to transfer WiiWare/VC games. I hope they would do that for at least a one-way upgrade path. Though I did have to cheat to get the correct spelling.. Excellent title - haven't touched it in sooooo long. But this and ultima: exodus were probably my first two role-play type video game titles when I as a kid. Not only do I have this and beat this on VC, I also got and beat it again on 3DS. Ever since Ninendo announced they were working on a new Zelda game, I've been going back and playing all the old Zelda games. The only one I still haven't beat is Zelda 2. Thanks for stopping in and commenting, and I'm glad you enjoyed the post! As for Nintendo and making money, did you see the latest financial report from Nintendo? CORRECT! Even though I didn't say you couldn't look it up, bonus for correct spelling. As for your Wii being packed away, how long do you think it will be packed away? Do you still own a copy of it in your NES collection? Are you planning on getting Skyward Sword when it releases, or just waiting on the one for the 3DS? Thank you all for the comments/feedback. @Chalgyr: Man, I forgot about Ultima Exodus!! @Anonymous: I completely forgot about zelda being on the 3DS with the ambassators program. I wish they would release some of those for the rest of us at some point. @Coffee: Am planning on it being stored through December and hoping it won't be too far past February. @Coffee - I do in fact still own this game in all of it's shiny golden plastic glory. Battery on it gave out years ago, so it's really only good for a quick play. @Robert - LOL - yeah, I loved that game when it came out. It was the closest thing to Dungeons & Dragons I came at that age. I remember sitting around making a ton of custom characters just for the heck of it. "...and hoping it won't be too far past February." I think I read somewhere how to change the batteries out in the old cartridges, but I may be thinking of something else like repairing the N64 controller's analog stick. No kidding, I hope it's not that long, but it's a possibility.